This is a nice clean 'Ocean City No. 923 Topsail All Purpose Large Capacity Level Wind Reel 250 Yards" as stated on the box. The reel features removable level wind, Multiple washer star drag, free spool, anti-backlash control, synchro-mech gears, self-lubrication bearing, On-Off click, Chrome plated spool, polished black exterior finish. The condition of the reel is fine, with no signs of use. There is some old brown line on the spool. 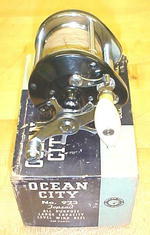 The reel is marked "OCEAN CITY 923 MADE IN PHILA. U.S.A.". The is a medium size reel, 2.2" inside spool width, 4" wide overall not including the handle. Also included is the parts list, guarantee, and instruction paper. The box is in good solid condition with one ink number written on the top, and worn edges, but is solid and look pretty good overall. A nice gift item for any fishing equipment collector or fisherman! Music Box pink Ver period Sailor Moon starry sky.